The White House says President Trump is watching Christine Blasey Ford and Brett Kavanaugh's testimony. If he's been watching on his favorite network, Fox News, he may be surprised. Rather than defending Kavanaugh at all costs, like the network's prime time hosts have been doing, Fox's daytime journalists and commentators highlighted Ford's credibility and humanity on display at Thursday's hearing. "I think Dr. Ford is exceptionally credible," Fox's top legal analyst, Judge Andrew Napolitano, said. 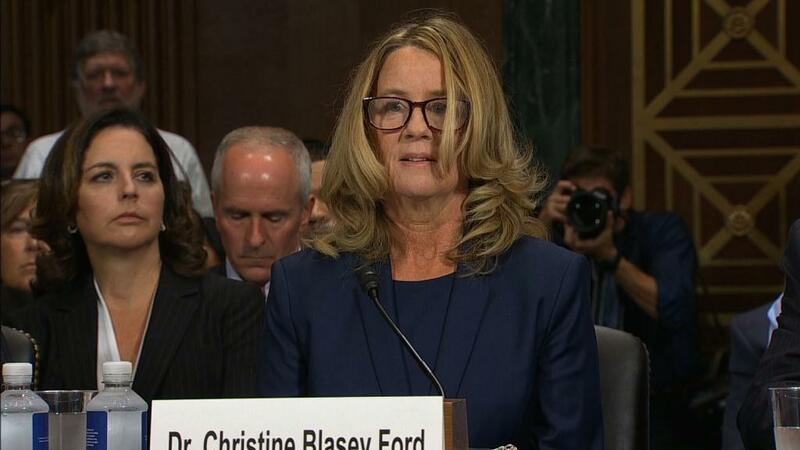 "A lot of folks" are "viewing her as a very credible witness," Supreme Court correspondent and 11 p.m. anchor Shannon Bream said. After the first break at Thursday's hearing, "Fox News Sunday" moderator Chris Wallace said "this is a disaster for the Republicans." The assessments on Fox echoed what was being said up and down the TV channel lineup. The NBC, ABC and CBS broadcast networks are all carrying the Senate hearing wall-to-wall, preempting hours of daytime programming. All the cable news networks are also live. But the tone of the TV discussions -- on Fox and elsewhere -- shifted after Kavanaugh's angry opening statement. He came out "guns blazing," Fox anchor Martha MacCallum said. She said that when she interviewed Kavanaugh on Monday, it was like he had "a cork in." Now, "it feels like the cork got pulled out." Fox commentator Britt Hume said Ford's testimony was "so impressive in its own way," but Kavanaugh was also persuasive. "I think we're probably, at the moment, back to where we were before the hearing started," Hume said after hearing from both Ford and Kavanaugh. "I think the scales have been rebalanced." Wallace said Kavanaugh managed to "match the emotion" and the raw moments of Ford's testimony. Earlier in the day, Wallace had expressed criticism of the GOP's outside counsel Rachel Mitchell for "treating this like a deposition, like a court hearing," while questioning Ford. But commentators on Fox gave Mitchell higher marks for her questioning of Kavanaugh in the afternoon. Given Trump's tight relationship with Fox, there had been a lot of curiosity about how the network would frame Thursday's hearing. All three of the network's prime time hosts -- Tucker Carlson, Sean Hannity and Laura Ingraham -- have cast doubt on the claims against Kavanaugh and expressed support for his nomination in many different ways. "What you are witnessing is one of the ugliest smear campaigns in history," Hannity said Wednesday night. It remains to be seen what those hosts will say after the hearing. But Fox's daytime coverage was led by MacCallum and Bret Baier, the network's two top political anchors. During the lunchtime break on Capitol Hill, some conservative Fox commentators, like Hume, emphasized that Ford's allegations are "uncorroborated." But there was also ample conversation about the #MeToo context and the cultural implications of the hearing. "We are in a different place today than we were with Clarence Thomas," liberal commentator Marie Harf said. Fox News, of course, was rocked by a sexual misconduct scandal within its walls two years ago. Fox News boss Roger Ailes was forced out after numerous allegations of harassment and assault were lodged against him. During a break in the Ford testimony, Napolitano said, "The president cannot be happy with this." But later, during Kavanaugh's turn, Napolitano had a more positive perspective for Republicans. Napolitano said he thought that the nominee's angry and tearful comments were "normal, natural and people expect it." As for the testimony, "quite frankly," he said, "it's riveting."